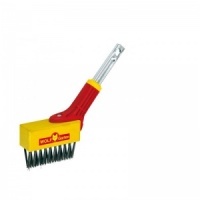 Wolf-Garten Weeding Brush Heads (Twin Pack) from the popular Multi-Change® inter-locking tool system, is specifically designed as replacement head attachments to the popular Wolf Weeding Brush. New replacement brush heads fit the Multi-change® Weeding Brush FBM to extend the life of the Weeding Brush, simply by removing the screws from the worn brush block and replace with a new one. Wolf tools represent high quality engineering and supplied with a 10 year guarantee.